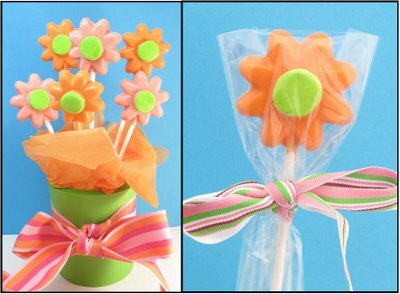 These daisy candy pops are SO easy to make you can drink wine while making them. (That’s what I did.) I gave these to my niece on her 1st birthday, but I’m pretty sure her older sister ate them. I found all of the above at Michaels except for the Americolor soft gel paste. See their website here for internet resources on where to buy. 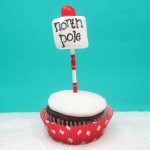 TIP: If you can’t find a circle fondant cutter exactly that size, you can also use the wide end of a metal decorating tip. 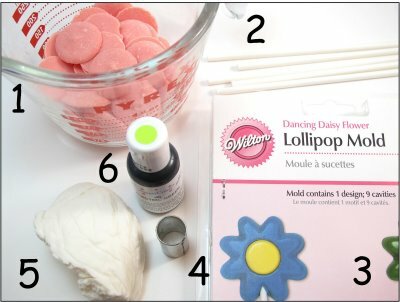 Place lollipop mold on a wax paper-lined baking tray. Melt candy melts according to package directions. I placed in Pyrex measuring cup and microwaved at 50% power for 1 minute, stirring, then at 50% for 30 second intervals until fully melted, stirring well. Pour into mold cavities, tap mold gently to spread and even the candy. 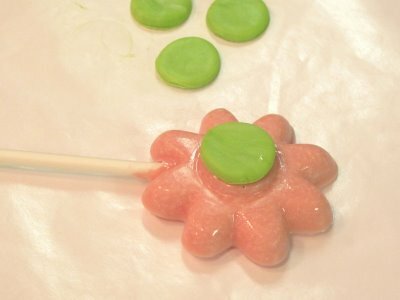 Put lollipop stick into place, rolling stick to completely cover with melted candy (so no white is showing). Place tray in refrigerator and chill until hardened, about an hour or more. 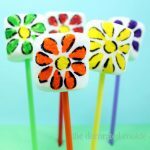 While pops are chilling, add a few drops of coloring to a palmful of rolled fondant. Knead very well until blended. Roll fondant thinly between two pieces of wax paper. If fondant is too sticky from handling, let sit for 15 minutes. Cut out circles with fondant cutter (or the wide end of a decorating tip) and let sit on wax paper at room temperature until stiffened. 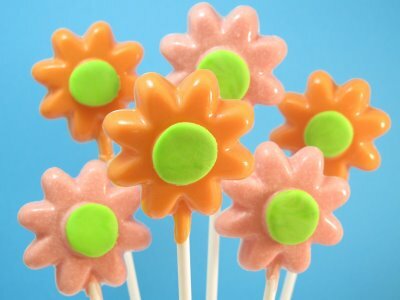 Pop daisies from molds. Dip your finger in light corn syrup and dab on back of fondant circle. Press center onto daisy. Let dry, overnight preferred. Wrap individually in cello bags and tie with ribbon for favors. Or make a bouquet. Cover each with a small cello bag, gather in a bouquet, tie with rubber band (to secure), then tie with a pretty ribbon to cover the rubber band. Make a flower arrangement. Choose a container and purchase a styrofoam block that fits (if it doesn’t fit perfectly, choose one that’s smaller). Insert styrofoam into container, pad with tissue paper to secure, and arrange pops in styrofoam. Put tissue paper on top to cover styrofoam. Place in large cello bag and tie with ribbon. So cute and simple. I love your presentation. 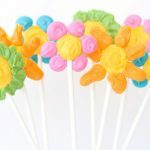 🙂 these are a happy bunch of edible flowers! I wish we had Wilton moulds here in Australia, that and candy melts! Oh well, I will just have to admire yours, love the colours you used, the presentation is great. 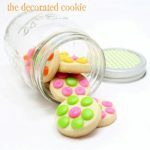 These would also make a nice get well gift instead of real flowers too! don’t you just love Wilton stuff? I have molds I haven’t even used yet…just kind of collecting them. I love the lollipops! so spring-tastic! SO cute and so happy, I love them! I’ll be linking. These are adorable! Just in time for spring :). Those are so cute. I make similar ones, instead of using fondant I make them all chocolate. I paint the centre in a contrasting colour with a wilton decorators brush and then pop in the freezer to firm up. You need to paint it quite thick for coverage. Then spoon or pour in the top colour. I’m going to check Michael’s for the mold you used, it is much cuter than the flowers I have. 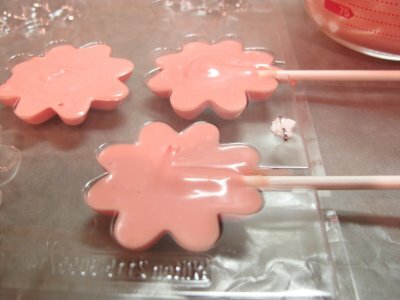 I’ve also tried using a candy melt/corn syrup mixture instead of fondant, but haven’t had much luck yet. I’ll try chocolate!